Green Papaya Pachadi| Omakka Pachadi is an easy to make Kerala style Thayir Pachadi. My mom used to make this tasty pachadi using the green papaya from back yard. She used to remove papaya just before making and make it fresh. I thought of sharing this recipe from the first year of my blogging. But due to one or the other reason it delayed and i am really donot like to miss to share this recipe at this Onam. The taste of this pachadi is similar as that of Cucumber Pachadi. 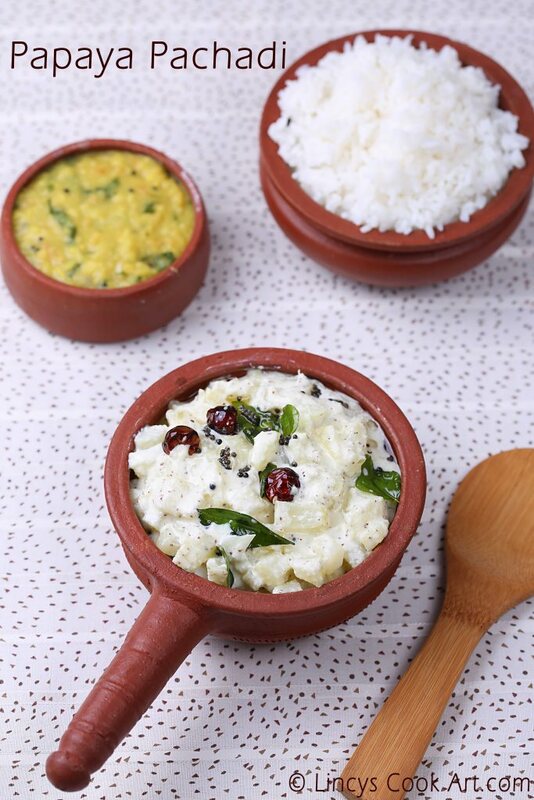 You could make this pachadi for Onam Sadya menu too. Apt at the time of guest arrival too. Quick fix healthy recipe to serve with rice. * Those who does not like mustard flavour replace it with jeera. Peel the papaya and chop them in to small cubes. Keep inside water and wash the papaya once. In a pan add the papaya and add enough water to submerge and allow to cook till soft with some salt. Papaya takes more time to cook when compare to cucumber. You could pressure cook for a whistle too to save the time. While it is cooking, grind the coconut, green chillies and mustard seeds together as a fine paste. Discard the papaya cooked water stagnating if any. Add the coconut paste and mix well and cook for thirty seconds and switch off the flame. Do not cook for long time as the mustard seeds tend to taste bitter. Once you switch off the flame add the thick beaten yogurt and mix well. Check for salt and add if required. Heat oil in a pan and splutter the mustard seeds and then add the dry red chillies and curry leaves. Transfer the tempering on top of the pachadi and mix well. Serve with Parippu curry, Avial combination.